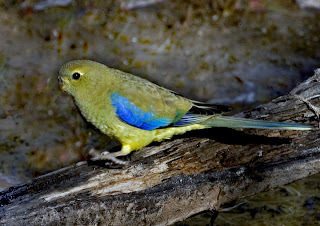 Arguably, one of the more interesting birds of the Redgate section of the Meehan Range, is the Blue-winged Parrot. I have seen a few on recent visits, and even managed a photo or two, as you can see. 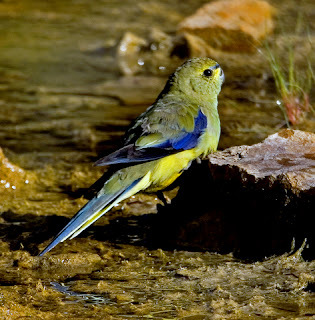 Twenty or more years ago, I had a study area here, and we (my son Matthew and I), would often hear the unmistakable 'tinkling' call of these parrots as they flew over high up. They were so high, that we only rarely saw them, and this eventually led to climbing the hills to look for them. We eventually discovered several nest sites along the ridge of the hills. I'm nowhere as fit as I was in those days, and the thought of the climb doesn't fill me with enthusiasm! (Perhaps I should get a lift up there on one of the illegal off road bikes that plague this area! They must be good for something). Occasionally, I've co me across them feeding in the open, dry grassed areas near the entrance, usually in pairs, but all these images were taken at the waterhole, some kilometre farther in. The waterhole is fast drying, and it will take more than the recent heavy showers to stop it drying out completely very soon. -throated and Black-headed Honeyeaters, Dusky, Flame, and Scarlet Robins, (most of them this year's young) and a succession of Green Rosellas, the latter arriving to bathe. 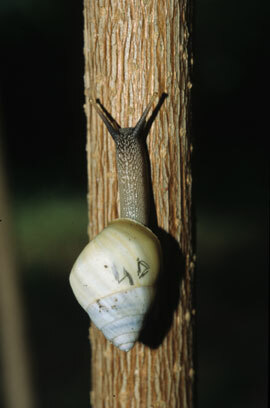 Sometimes I get so engrossed in watching some small piece of behaviour by one species, that I fail to notice a new arrival. And that's what happened with the Bluewings shown here. I glanced up at some movement almost overhead, and there, only a few metres away was the Bluewing illustrated at top right. And that was the only shot I managed, before it flew. Fortunately it joined a few others that had landed, unseen by me, on the far side of the waterhole and they warily approached to drink. A little too far away for great shots of what is after all, a "budgie" sized bird, but you take what you're given. They drank and sunbathed for a while, before suddenly flushing and disappearing into the treed area up the valley. The top two shots are adult birds, and the lower right a juvenile. I'm hoping the water in the waterhole will hold out just a little longer, and I get another opportunity to photograph these delightful parrots. 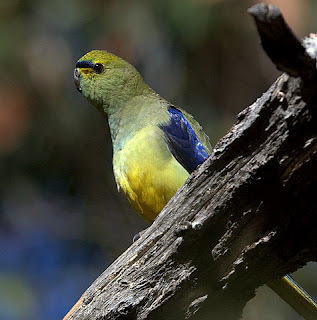 Blue-wings are delightful birds but are terribly reluctant to get their photos taken! Last time I was dwon near Portland, I got marvellous views of a small group of them. They were happy to hang around until the camera came out. Then they were either behind vegetation, in the shadows or ... somewhere else entirely. That top pic captures the personality perfectly!